First collection for for Stranger In Truth, a womenswear label with a focus on material innovation and experimentation. Space Nomads illustrates a surreal future where the lack of resources has led to an exploration of new material frontiers. In this world, utility is key: clothing is functional and hardy with minimalist lines. The collection utilises textiles used in car and boat manufacturing such as woven aluminium fibre sheets, ripstop nylons and technical fabrics for military and performance wear. Designed for durability and resistance, the garments are inspired by underground workwear worn by railway construction workers and miners. 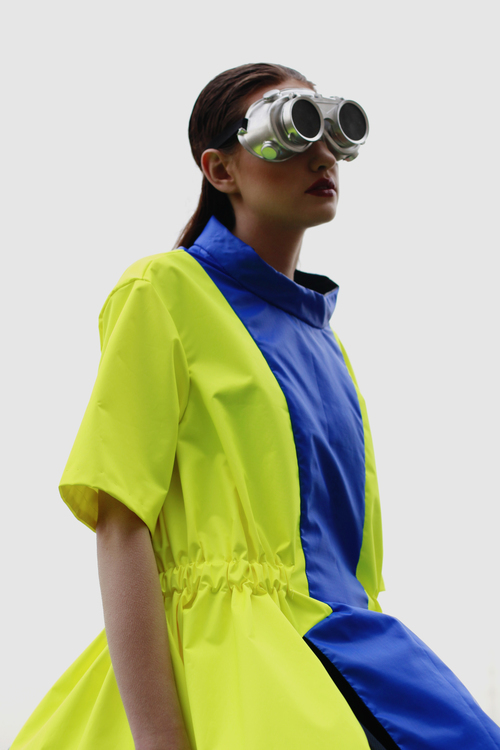 Silhouettes were also further developed by 3-d manipulation of elements such as safety vests and harnesses, while the colour palette contrasts neon yellow with shades of blue and grey. Need help advertising your products?